in case of a firm, company or body corporate, society registered under the Societies Registration Act, I860, a public trust registered under any law for the time being in force relating to registration of public trusts or a local authority, the application for membership is accompanied by a resolution authorising it to apply for such membership. The Registrar, on receipt of such application, shall forward the same to the society concerned together with requisite share money and entrance fee within thirty days from the date of its receipt. The Society shall take the decision and communicate the same to the applicant within sixty days from the date of receipt of such application as provided in sub-rule (2) and if no decision is communicated to the applicant within the said period of sixty days, the applicant shall be deemed to have been admitted as a member of such society. In case the society refuses to admit the applicant as its member, it shall communicate the decision within the period of sixty days mentioned in sub-rule (3) with reasons therefore and refund the share money and entrance fee with such communication. If the society fails to refund the said amount, it shall be liable to pay interest at 15% per annum on the said amount from the date of such communication and the said amount if not paid, shall be recovered as arrears of land revenue. A society may admit joint members provided they make a declaration in writing that the person whose name stands first in the share certificate shall have the right to vote and all the liabilities will be borne jointly and severally by them as provided in the Act, rules and by-laws. In accordance with the procedure laid down in its by-laws and these rules for admission of any member, a society may admit minors and persons of unsound mind inheriting share or interest of deceased members as its members through their legal representatives or guardians, respectively. The members so admitted will enjoy such rights and liabilities through such legal representatives or guardians as are laid down in the bylaws of the society that are consistent with the Act and rules. Subject to the provisions of the Act, the rules and the by-laws of the society, a member may withdraw from the society after giving three months' notice to the Secretary of the society of his intention to resign his membership of the society. 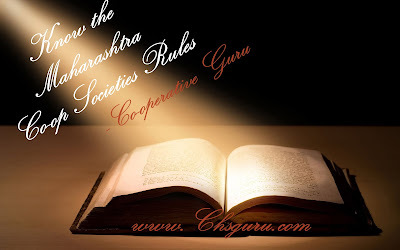 No resignation of a membership shall be accepted by the society unless the member has paid in full, his dues, if any to the society and has also cleared his liability, if any, as surety to any other member or otherwise. The withdrawal from membership shall also be subject to such restrictions regarding the maximum amount of share capital that can be refunded in a year or as may have been provided for in the Act, the rules or by-laws of the society. Any member, whose resignation has been accepted by the society, or any heir or legal representative of a deceased member, may demand refund of the share capital held by such member or deceased member and the society shall, subject to the provisions of sub clause (3) of Section 29 and subject to the provisions of the by-laws, refund the amount within six months from the acceptance of the resignation or, as the case may be, the date of demand made by the heir or legal representative of the deceased member. In all the cases where share capital is to be refunded, valuation of the shares to be refunded shall be made in accordance with the provisions contained in Rule 23. Immediately after the 30th June of every year and as soon as possible before the annual general meeting, individual members admitted to membership up to the 30th June of the preceding year (hereinafter referred to as "the relevant date"), shall elect delegates equal to one-fourth of the number of societies admitted to membership up to the relevant date or one delegate for every twenty-five individual members (fractions being neglected) whichever is less. The delegates so elected will continue in office till their successors are elected after 30th June next. Every society through its properly authorised representative and every delegate referred to in clause (a) above shall have one vote in the general meeting. Provided that the delegates shall not at any time in the meeting exceed one-fourth of the number of representatives of the societies. The election of delegates shall be held in accordance with the provisions of the by-laws. Any vacancy of a delegate caused on account of cessation of membership shall be filled by the delegates by co-opting one of the individual members. Unless otherwise provided by the Registrar in respect of any particular society, the delegates on the committee or the Board of Directors, as the case may be, shall not at any time exceed one-third of the number of representatives of societies (fraction being neglected). Provided that the amount so ascertained shall not exceed the actual amount received by the society in respect of such share or interest. Where a person is allotted a share by a society, the payment required to be made therefore shall not exceed the face value of the share notwithstanding anything contained in the by-laws of the society. When a share is transferred by a member to another member duly admitted as a member of a society, the transferee shall not be required to pay anything in excess of the value of the share determined in accordance with sub-rule (1). the transfer is registered in the books of the society. Any charge in favour of the society on the share so transferred will continue unless discharged otherwise. For the purpose of transfer of his share or interest under sub-section (1) of Section 30, a member of a society may, by a document signed by him or by making a statement in any book kept for the purpose by the society nominate any person or persons. Where the nomination is made by a document, such document shall be deposited with the society during the member's life time and where the nomination is made by a statement, such statement shall be signed by the member and attested by one witness. The nomination made under sub-rule (1) may be revoked or varied by any other nomination made in accordance with that sub-rule. Where a member of a society has not made any nomination, the society shall on the member's death, by a public notice exhibited at the office of the society, invite claims or objections for the proposed transfer of the share or interest of the deceased within the time specified in the notice. After taking into consideration the claim or objections received in reply to the notice or otherwise, and after making such inquiries as the committee considers proper in the circumstances prevailing, the committee shall decide as to the person who in its opinion is the heir or the legal representative of the deceased member and proceed to take action under Section 30. The name and address of every person nominated for the purposes of sub-section (1) of Section 30 and any revocation or variation of such nomination shall be entered in the register kept under Rule 32. On receipt of the deposit, the society shall issue a receipt for the same. Where the copies are prepared, the amount due from the member according to the scale laid down in sub-rule (1) shall be retained by the society as copying fees and the surplus amount, if any; remaining Lout of the deposit shall be refunded to the member at the time of supplying copies. Where the amount deposited by the member is found to be insufficient to cover the copying fees, the member shall be called upon to pay the deficit before taking delivery of the copies. The copies shall be certified and signed as true copies by any person duly authorised in this behalf by the committee or under the by-laws of the society. Any member who has been persistently defaulting payment of his dues or has been failing to comply with the provisions of the by-laws regarding sales of his produce through the society, or other matters in connection with his dealings with the society or who, in the opinion of the committee, has brought disrepute to the society or has done other acts detrimental to the interest or proper working of the society may, in accordance with the provisions of sub-section (1) of Section 35, be expelled from the society. Expulsion from membership may involve forfeiture of shares held by the member. Where any member of a society proposes to bring a resolution for expulsion of any other member, he shall give a written notice thereof to the Chairman of the society. On receipt of notice or when the committee itself decides to bring in such resolution, the consideration of such resolution shall be included in the agenda for the next general meeting and a notice thereof shall be given to the member against whom such resolution is proposed to be brought, calling upon him to be present at the general meeting to be held not earlier than a period of one month from the date of such notice and to show cause against expulsion to the general body of members. After hearing the member, if present, or after taking into consideration any written representation which he might have sent, the general body of members shall proceed to consider the resolution. When a resolution passed in accordance with sub-rule (1) is sent to the Registrar or otherwise brought to his notice, the Registrar may consider the resolution and after making such enquiries as he may deem fit, give his approval and communicate the same to the society and the member concerned. The resolution shall be effective from the date of such approval. 40 paise for every 200 words or less in English and 50 paise for every 200 words or less in Marathi.